CrimethInc.’s “Work”: A Failed Attempt at a Post-modern Critique of Labour? There is a growing sentiment today that we are approaching “post-capitalism,” a new phase of society in which resources are no longer extracted for profit with no mind paid to sustainability or social justice. There are many schools of thought on this, ranging from free(d) markets, to the “circular economy”, to the zero marginal cost society. All share some common features, most notably the idea that continuing to swap things will cause capitalism to eat itself and lead us through to a sustainable, just society. Swapping things may be part of life in post-capitalism, this much is certainly true. But there are several reasons that swapping things is not the key to the sustainable and just future we are increasingly being promised. These proposed paths to post-capitalism are more forward-looking than the navel-gazing maintenance of the status quo that remains ever-popular in mainstream thought, but only just so. The conclusion that market exchange or market-like exchange will have the purported effects of social justice and sustainability require leaping over a wide logical chasm, and several largely unexamined weaknesses of market-based sociality prevent it from making this leap. I will be examining the weaknesses of market-based theories of post-capitalism in this series. This part of the series deals with deadlocking. The mismatch between the two demand profiles causes a deadlock in a market-based society: Those who produce consumable goods will quickly have their demand for durable goods of each type satiated —people only need one houses, and usually only one of any other type of durable good. Further, since most durable goods are produced socially, the exchange for durable goods must be divided amongst many people (this is not to say that consumables are not produced socially). This causes deadlocking, where the producers of durable goods need consumable goods but the producers of consumable goods have no more need for durable goods. This deadlock is experienced in today’s society, and it certainly doesn’t cause the economy to come to the grinding halt that one would expect. There are two common solutions to the problem, possibly among others, neither of which is compatible with sustainability or social justice. One solution is to reduce the durability of the durable goods—one notable example of this is the Phoebus Cartel, a group of lightbulb manufacturers that colluded to reduce the lifespan of light bulbs in order to prevent the loss of continuous revenue. This is clearly undesirable because it is a form of sabotage of industry. The other solution is continuous growth, which is one of the greatest sources of current ecological and social problems. There is only one way to solve this deadlocking problem, which is provision without exchange. Because of the finite demand profile of durable goods, these should be provisioned in such a way that they can be used efficiently by many people at once. Demand for most products is really just demand for the services the product provides (e.g. demand for cars can be fulfilled by transportation services). Demand for durable products, therefore, can be adequately fulfilled in most cases through shared products that provide the services individuals need. Even demand for consumable products should be considered in terms of creating the infrastructure for consumable production services. These are necessary conditions for sustainability and social justice if we are to establish a reasonable standard of living for people. How do we make the decisions needed to implement this? Each community must engage in distributed planning. Demand should be estimated through community effort to form an initial guess of the magnitude of demand as well as its temporal and spatial distribution. 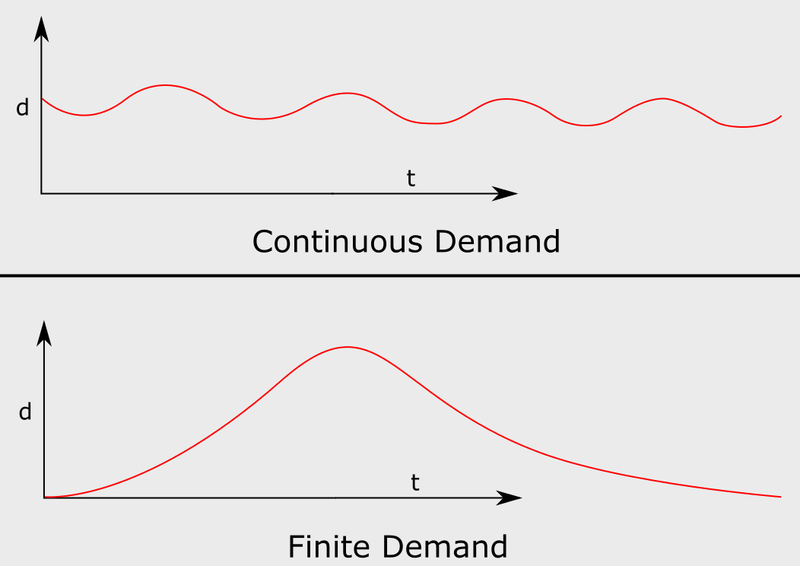 The supply of products to provide the services needed to adequately fulfill the demand for the services they provide can be estimated using the stochastic methods of queuing theory, such as the Erlang-C formula. The placement of the products can be figured using a geometric method such as finding the centroid of the demand distribution. This sort of practice is commonly regarded as prohibitively difficult and laborious, and that would be true if this whole process had to be done using only personal property and market exchange. However, using shared property, direct provision, and fulfilling demand using the provision of services instead of the ownership of objects, most of the work only has to be done one time, making this a much more practical goal. In fact, for a sustainable and just society, there is no goal more practical: The resource-intensive and inefficient practice of fulfilling a demand for a service needed for only hours or minutes per day by giving each individual a product that provides the service for 24 hours a day will always result in either overexploitation or a standard of living orders of magnitude below what is truly possible. The light bulb gambit looks like a strategy for converting durable goods into consumable goods. Another example (more far-reaching, I expect) is the “X as a service” trend, such as replacing the VCR (you bought it you own it) with the DVR (you license it by the month). The annuity (the series of level payments off into the future) is the gold standard of finance, so there is also the trend toward providers of monthly-billable services wanting to lock you into contracts. Meanwhile in the labor market the trend is away from the steady-eddie job with the steady-eddie weekly (bi-weekly, etc.) paycheck in favor of temp jobs, gigs, piecework scams, etc. This is Jacob Hacker’s “risk shift” on steroids.